Uttar Pradesh Chief Minister Adityanath Yogi on Wednesday allocated portfolios amongst 46-ministers of his Cabinet. 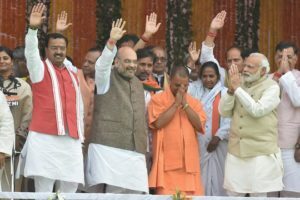 While Yogi kept the crucial and highly sought Home and Revenue Department, along with three dozen other departments, with himself, he gave the Public Works Department (PWD), Food Processing, Entertainment Tax and Public Enterprises Department portfolios to Deputy Chief Minister Keshav Prasad Maurya. Another Deputy Chief Minister Dr Dinesh Sharma was allocated the Higher and Secondary Education, Science and Technology, Electronics and Information Technology departments. BJP’s official spokesperson and heavy weight minister Siddharth Nath Singh was allotted the Health department, while Mathura MP Srikant Sharma was given charge of the Energy portfolio. Cricketer-turned-politician Chetan Chauhan got the charge of Sports ministry. Atul Garg: Fertiliser supply, Rent Control, Consumer Protection, Food Security etc.